MANILA — Andi Eigenmann is expecting another baby. The actress made the announcement on her Instagram Stories page on Friday as she shared a photo of her growing baby bump. She said she is now 14 weeks and three days pregnant. 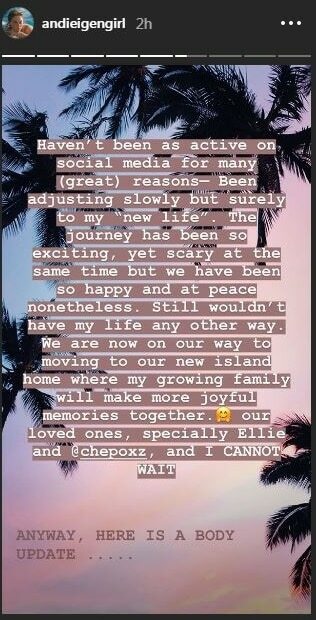 “We are now on our way to moving to our new island home where my growing family will make more joyful memories together… and I cannot wait,” added Eigenmann, who is in a relationship with surfing champion Philmar Alipayo. Eigenmann gave birth to her first child, Ellie, in November 2011. Ellie is the actress’ daughter with her former boyfriend, Jake Ejercito.